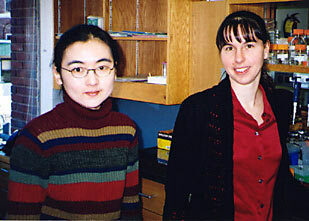 “I am thrilled that I will be supported by the Wyman Fellowship to do my work,” says Dr. Jin (l .), in the lab with Dr. Rachelle Gaudet (r. ), Assistant Professor of Molecular and Cellular Biology, who nominated her for the award. Xiangshu Jin, a postdoctoral fellow in the laboratory of Rachelle Gaudet, Assistant professor of Molecular and Cellular Biology, is the first recipient of the Jeffries Wyman Fellowship awarded in MCB. The fellowship, endowed by Jeffries Wyman III in honor of his father, supports the work of graduate students and postdoctoral fellows working in molecular biology, particularly in biophysical chemistry and structure and function of biological macromolecules. “As the research develops, I would also like to expand my work on other related TRP channels. This research enables me to be exposed to a variety of interesting biological research problems, and an excellent opportunity to learn and improve experimental techniques as well as my skills as a research investigator,” she concludes. The endowed fund honors Jeffries Wyman AB ’23 (1901-1995), a member of the Harvard Biology Department from 1928 to 1951, who may be best known for his work on the dielectric properties of amino acids, proteins and related compounds, and on the physical chemistry of hemoglobin. He served as the first scientific advisor to the US Embassy in Paris 1951-54; directed a regional science office in the Middle East for UNESCO 1955-58; and returned to scientific research as a guest scientist at the University of Rome’s Biochemical Institute and Instituto Regina Elena, where he focused on the structure and function of hemoglobin. He cowrote the textbook, Biophysical Chemistry , with his lifelong friend and colleague, Dr. John Edsall. He died at his home in Paris in 1995.